Have you been searching for the right �turn-key� restaurant opportunity that makes money from day one? Or, have you been looking for a great location you can use in a conversion? If so,check this listing out. After being at this location for 22 years, the current owners getting out of the restaurant business. 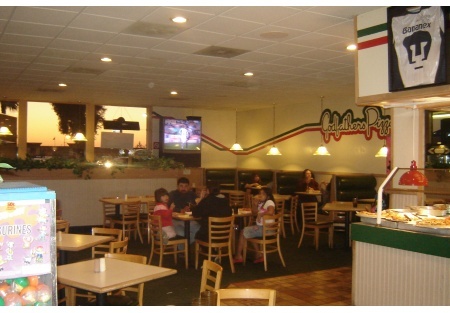 This national pizza franchise has been a staple in this community for years. It has a solid customer base and an established school delivery program. The restaurant is at the signalized intersection, and is across from a regional shopping center. The center has high volume retailers. This location has average annual gross sales of $560k in a 3,000 sf space with $4,850 monthly rent. The key to this locations profitability is the outstanding rent � its cheap! This location is a stand alone pad on one of the busiest thoroughfares in Chula Vista. While this location is within a recently remodeled strip center; the subject property was not remodeled and is in need of a little TLC. This area is one of the main shopping area�s for Mexican nationals who travel up from Mexico daily. The surrounding dense population in a 3-mile radius is approximately 198,483 and 30,095 within 1 mile. Traffic counts on the main street in front of the location is approximately 25,300 daily, and 6,500 daily on the side street. This location can provide a great platform for your business! The best feature of this restaurant is the location, rent, and reputation within the community. This is an opportunity for a turn-key business, or an outstanding location for a conversion that fits an area with a high Hispanic population. The key employees are in place and could be there to help jump start your new business.